Daylight Saving Time (DST) is often incorrectly referred to as “daylight savings time”. In some countries, it is also called “summer time”. When DST is not observed, it is called standard time, normal time or winter time. 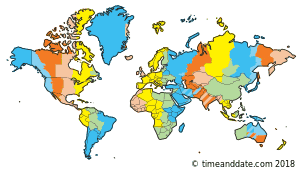 This list displays a brief (but not complete) overview showing the countries and territories which plan to observe DST during the first half of 2020. Note that this list might not be final - countries, territories, and states sometimes make adjustments which are announced just days or weeks ahead of the time change. Also, please see the page for the second half of 2020 or the overview over start and end times for 2020 sorted by country. One Hour Back or Forward? Is Summer Time the Same as DST? Winter Time or Standard Time? What's the International Date Line?